Today, I have fellow author, and friend, Alexander Nader on the blog to talk about his newly released adult urban fantasy title, Beasts of Burdin. LM: The story line around Beasts of Burdin contains a good number of demons. Did you pull from mythology, your imagination, or both? AN: All of the demon names in B.o.B. are real and most of the abilities are too. I took some liberties with the physical descriptions to make them suit my needs. There really is a demon made of eyeballs, though. I didn’t make that up. As soon as I read about it I was like, “I have to find a place for this guy”. LM: Researching is one of my favorite aspects of writing. It’s crazy what you come across. Was is it the demons that inspired the story or something else? And I really liked Ty Burdin, he isn’t your ordinary demon hunter, where did the idea of his character come from? AN:The idea for the story came from a twisted version of a song lyric. The original lyric was, “The greatest trick the devil ever pulled was convincing me that I was him”. I played around with that in my head until I ended up with, “The greatest trick humanity ever pulled was convincing itself the devil existed”. From there it rolled into people creating demons with their minds. All of the demons just came from ideas. Human mythology is pretty deep, so when I needed a war-demon, I just searched until I found something. As far as Ty goes, he is the adoptive child of this whole hard-boiled noir phase I’ve been going through lately. It started when I read a comic book re-imagining Wolverine as an old school private eye. After that, I read The Maltese Falcon and then moved on to Philip Marlow. The brutal honesty of the characters struck me enough to want to make that modern. Hopefully, that’s what I’ve accomplished. LM: I like the idea of reinventing a song lyric to suit your story telling needs. And speaking of writing itself, how long have you been writing? Did you always aspire to be an author? I’ve always kind of jumped from hobby to hobby, but writing is the first one that has really felt right. It’s the first thing I can actually see myself doing. LM: 🙂 Looks like you found your calling. Any of those hobbies you care to share with your readers? And speaking of hobbies, what else do you do with your time when you’re not writing? AN: As a kid it was mostly extreme sports of one sort or another. BMX, rollerblading, snowboarding, skateboards. I was never any good with the board sports though. Most of my teens were wasted on video games and cars, if you can call that a hobby. Then it became guitar. I would probably still be playing guitar if I didn’t hate the sound of my own voice. I go through spurts where I exercise a lot followed by long periods of physical dormancy. A little bit of everything really. Nowadays, when I’m not writing I’m usually just trying to catch up with my wife and kids. I work a lot, so any time not working is family time. I’m currently learning a lot about Pokemon and Beyblade, while teaching about Mario and super-heroes. It’s a pretty awesome trade-off. LM: That’s a great trade-off. So, for anyone who might not know, Beasts of Burdin is a series, can you tell us anything about book 2? 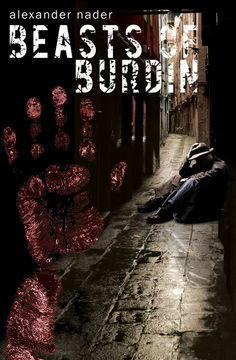 AN: Burdin 2 (Burdin of Choice) is done. When this is posted I think I will be working with the my publisher on the cover art. It should hit the shelves November 10th. It’s definitely going to feel a little different, but the story gets bigger. There are more characters, more suspense, more intrigue, more jerkwaddery (<- I don’t know how Laney feels about language on her blog, so that’s a nifty little bit of self-editing. ), more demons, more alcohol, and more cigarettes. Don’t worry though, all of that stuff is in the first book too, there’s just more in the second book. People will be able to pick up Burdin of Choice and feel like they were right where they left off; listening to the drunken ramblings of a vaguely retired demon hunter. LM: Thanks for the self-editing on my account. 😉 I think we’re good. Any tips you can give other writers hoping to be published one day? AN: Write for you and no one else. When you stop worrying about whether or not someone will publish your writing is when you’ll write something worth publishing. That’s how it worked for me anyway. LM: Couldn’t agree with you more on that. Plotter or Pantser? AN: Little bit of both. I make a thoroughly detailed outline of about twenty sentences and go from there. I guess I vaguely plot the entire book and then kind of pants the individual chapters. If that makes any sense. LM: ‘Pants’ the chapters is one I haven’t heard yet. 😉 Coffee or Tea? AN: BOTH! Green tea only though, I’m not big on black tea anymore. I prefer my coffee with chocolate, but have been known to drink it straight, no chaser, when in a bind. LM: Tea for me, unless it’s iced coffee. E-Book or Print? AN: BOTH. I like to have books on my shelves. It looks good and makes me feel all accomplished and such, but it’s hard to argue the convenience of ebooks. I keep the Kindle app on my phone and try to sneak in a couple pages every time I’m waiting for something. LM: Me too. Introvert or Extrovert? AN: An introverted extrovert. HA! How’s that for clarity. Yeah, I’m a little on the fence. About everything, apparently. Anyway, I seem to be okay at talking to people and functioning in groups, but I don’t really like it and try to avoid it at all costs. LM: I think that sways you pretty far into the introverted group, like so many writers. 😉 Thanks for taking time out to talk with me, Alex. It was fun. “Ty Burdin! Answer the phone already. It’s your brother.” The voice comes from the next room in a tone usually used by stress-fried mothers, not twenty-something-year-old receptionists. The harsh words crack through my whiskey-soaked brain like someone snapped a bullwhip in my ear. I pick my head up off the desk and wipe the drool from my mouth, as she bursts in the door. “He’s adopted, and good morning,” I say, opening the drawer to my desk and digging through it. “It’s not morning. It’s past noon, you lazy drunk.” Her tone is accusing, but there’s a slight smile to her ruby red lips. I really do think Nora gets enjoyment from trying to keep me in line. Her rockabilly style, all tattoos and polkadots, might scare some people off, but honestly, I think it’s kind of cool. “Fine, I was wrong about the time, but you’re wrong, too,” I say. “Oh, yeah? How’s that?” Nora kicks her hip to the side and props a hand on her leopard print skirt. “I’m not drunk. I’m hungover.” I pull out a flask full of scotch and take a long drink. “I’m working on getting back on track, though.” I tip the flask toward her. “I swear someone’s gonna find you in a ditch one day.” Her voice has a trace of concern, but it’s mostly drowned out by annoyance. “In my line of work, that’s almost a guarantee. Now, can you tell me why you disturbed my ugly sleep?” Ugly sleep is a gross understatement. No amount of alcohol ever seems to drown out the vision of the young, innocent girl burned into my memory. The scene is even more ominous in my dreams than it was in real life. “No.” I have the phone, but honestly, I hate it. Nora sets the still ringing phone on my desk, puts her hands on her hips and, using only facial expressions, guilts me into picking up. “Hello,” I say into the phone that smells of smoke. I use my free hand to dig out cigarettes and a lighter. “Ty! Finally, man, where you been?” Hartnet asks. “You prefer whatever’s in front of you as long as there’s a proof label on the bottle,” Hartnet says. I could say that the plot was tight, the story moved at the speed of light, and I liked the new approach on demons versus the world, and that would all be true, but even more than that— what kept me turning the pages was Ty. His voice is fresh and witty and sarcastic, and I found myself getting wrapped up in his words, the way he talked, the way he saw life. Really a great book that pulled me out of my own head and put me in someone else’s. For me, that’s the benchmark of a good story. Can’t wait to see what Ty gets into in Burdin 2. So go on, check it out for yourself. This entry was posted on February 21, 2014 by Laney. It was filed under Blog Tours, Giveaways, J Taylor Publishing, New Releases and was tagged with Adult Urban Fantasy, Alexander Nader, Author, Beasts of Burdin, Book Giveaway, book tour, Fiction, J. Taylor Publishing, laney mcmann, Ty Burdin, Upcoming urban fantasy 2014, Writer.